There has been worship on this site for several centuries, but the present building was completed in 1858. 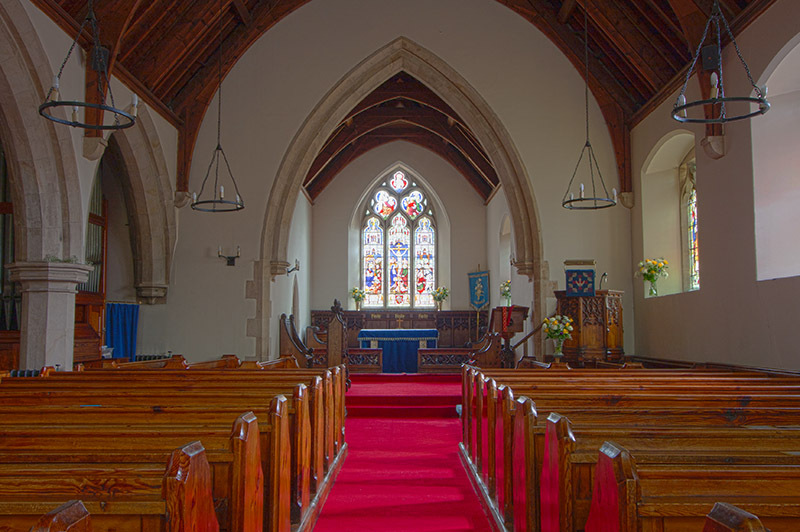 It was built in the neo-Gothic style to replace an earlier one which had grown too small for its congregation. This was funded jointly by two local landowners: the Wheatley-Balmes of High Close and the Robinsons of Elterwater Hall. 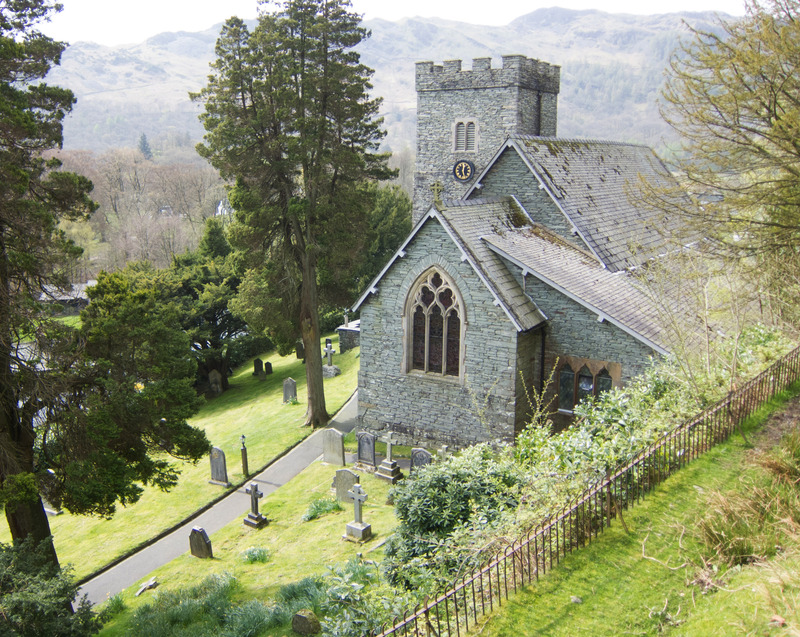 Originally Langdale church was a chapel, overseen by a Curate, within the parish of Grasmere. 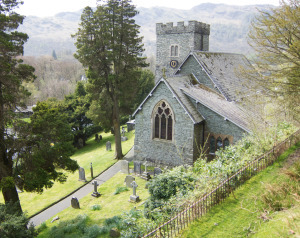 The vicar of Grasmere alone was authorized to perform baptisms, weddings and funerals. Dead bodies wrapped in a shroud, would have been carried over the hill before the present road existed, on a stretcher-like wooden construction which is still preserved in the cellar. These corpse roads still exist in many parts of Cumbria and the one from here to Grasmere is especially well known – please see the excellent “Corpse Roads of Cumbria” by Alan Cleaver & Lesley Park if you want to find out more about this. 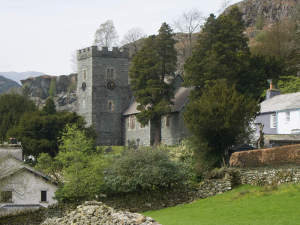 Evidence of the Grasmere connection also survives in one part of Grasmere parish church which is still called “the Langdale Aisle”. 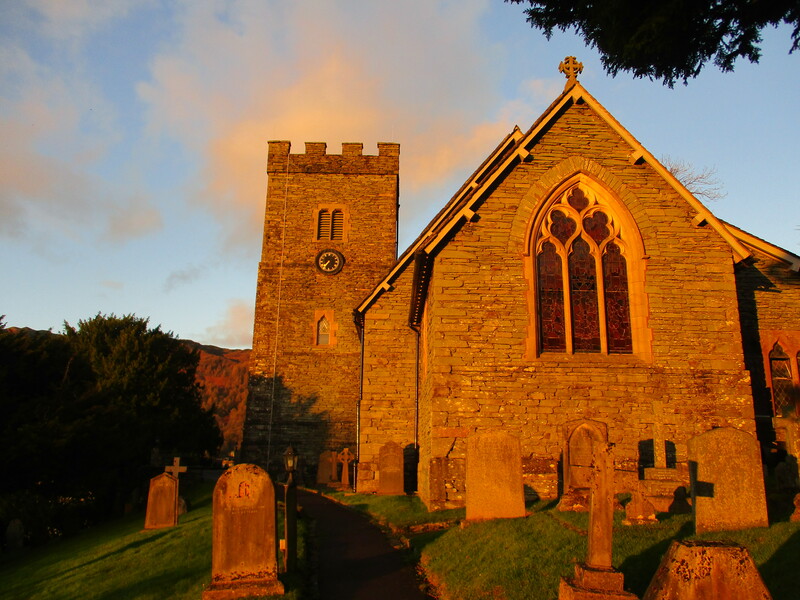 In 1863 however, Langdale Chapel was raised to the status of being a parish church in its own right, and its then Curate became the first Vicar of the newly created parish with responsibility for “the cure of souls” in both Great and Little Langdale. Pause for a moment of stillness as you look towards the altar and take in the atmosphere of the place. Graceful arches that divide the nave from the north aisle support one side of a fine timber roof. Facing east the simple, uncluttered interior leads the eye to a three paneled window showing the nativity, the crucifixion and Christ’s appearance to Thomas whose reluctance to believe without firm evidence is said by some to be a typically Cumbrian trait! Above the simple altar the words “Holy Holy Holy” on the reredos remind us of the presence of God in this place. 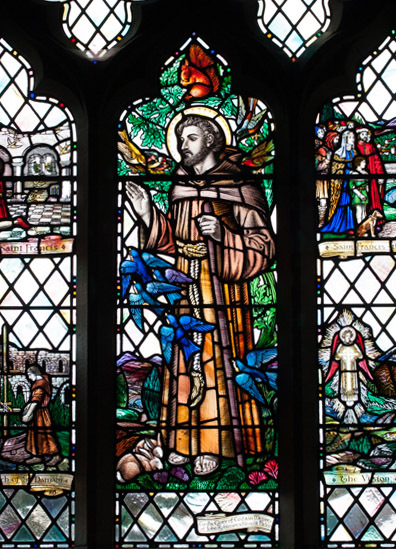 Probably the most interesting of the stained glass is that on your right as you face the altar – the St Francis window. It was designed in the valley by a local artist whose nephew still lives in the same house and it shows some characteristic Langdalian scenes: water, birds and a red squirrel. 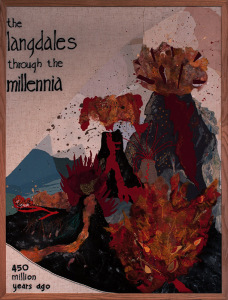 For many people the highlight of their visit is the Millennium Tapestry. This runs along the northern wall and was designed and embroidered by women and school children from the parish. It is arranged chronologically and shows the story of the valley from glacial times. (Do use the spotlight switch on one of the pillars to see it more clearly and take one of the explanatory leaflets). Pews were removed from the back of the church to allow for the building of a lavatory with disabled access and a small kitchenette. The space thus created in the back of the church is sometimes used for exhibitions, lectures and as an area for informal mixing after services and other events. The tower houses a belfry with a peal of 6 bells, installed in 1860. These were retuned and placed on modern fittings in 1960. Fuller details of the bells and ringing times are on the notice board in the porch. Visitors, ringers and non-ringers are warmly welcomed into the ringing room. The clock is sometimes called “Big Ben’s country cousin” as it is a scaled down version of the Westminster one. More details about the clock are in a pamphlet by the door of the church. Also available is a much fuller guide to the history and architecture of the church. Either of these can be bought for a small sum. There are two particularly noteworthy gravestones in the churchyard. First is that of the English historian George Macaulay Trevelyan who brought a great literary talent to the writing of history. Some of his work describes the history of religious and personal liberty in England. Trevelyan was also a powerful advocate for the National Trust. In the 1920’s he wrote an eloquent booklet called ‘Must England’s Beauty Perish?’, which helped to regalvanise the Trust after a period of declining membership. In addition he was a major donor to the National Trust. He used to holiday in Robin Ghyll, a cottage not far away in Great Langdale, and some local people still remember him. He is buried in a grave to the east of the church not far from the War Memorial. The second especially noteworthy gravestone is famous because of its Wordsworth connection. 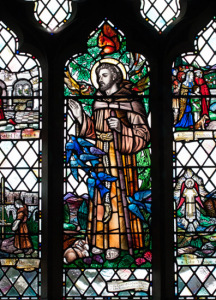 A previous Curate at the parish called Owen Lloyd was the nephew of Wordsworth’s brother and a highly respected member of the poet’s social circle. 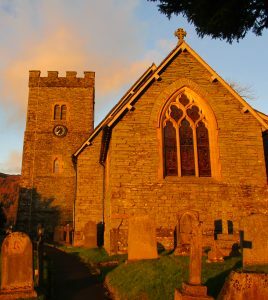 Wordsworth wrote a moving tribute to him which is inscribed on his tombstone in front of the main church entrance, just under the yew tree which Owen himself planted.